The Durmstrang Institute (German: Durmstrang-Institut für Zauberei) is a Wizarding school that is notorious for teaching the Dark Arts. It is located in the northernmost regions of Norway or Sweden. Durmstrang has, however, taught students from as far afield as Bulgaria. Durmstrang was one of the three schools that competed in the Triwizard Tournament in the 1994–1995 school year. It is an old school, having existed since at least 1294. The students at the school wear fur cloaks, fur hats, and blood-red robes. Durmstrang does not admit Muggle-borns. However, it is shown that the students may not necessarily share this idea, as Krum attended the Yule Ball with Hermione Granger, who is Muggle-born and would not have been admitted at his school. In the films, Durmstrang is said to be a male-only school, though in the books all genders are seen entering Hogwarts as representatives for their school. Durmstrang was founded sometime during the Middle Ages by the great medival witch Nerida Vulchanova who served as the very first head of the school, followed after her mysterious demise by Professor Harfang Munter who established Durmstrang's reputation for emphasizing martial magic as an impressive part of its curriculum. In 1294 the Triwizard Tournament was established as a friendly competition between Durmstrang Institute, Hogwarts School of Witchcraft and Wizardry and Beauxbatons Academy of Magic. But in 1792 a Cockatrice went on a rampage and injured the Heads of all the schools. The Triwizard Tournament was then suspended indefinitely, only recommencing in 1994. In 1894, Gellert Grindelwald was accepted into Durmstrang Institute. Although the school was oriented towards the Dark Arts, Grindelwald's experiments in dark magic were considered too dangerous for the students. After a certain amount of time, even Durmstrang could no longer ignore Grindelwald's dangerous studies, and expelled him. Before he was expelled, he carved the calling card of his obsession, the mark of the Deathly Hallows, on a wall of the school, which remained there long after his defeat. At some point after 1981, Igor Karkaroff rose to the position of Headmaster of Durmstrang and is known as immensly unpopular in this position, having several students removed from the school by their parents for his ruthlessness. During his time as the school administrator, some students copied Grindelwald's symbol onto their books and bags to impress others, but were "taught a lesson" (presumably in the form of retribution) by those who lost family members to Grindelwald. Durmstrang arrived at Hogwarts for the Triwizard Tournament by ship, an enormous vessel in which they also slept during their stay in Scotland. They put on an introductory ceremony featuring the use of walking sticks. They chose the Slytherin table, due to similarities of outlook, no doubt, and ate there. Bulgarian Quidditch Seeker, Viktor Krum, attended Durmstrang, and was still in school during the 1994 Quidditch World Cup. That same year, the school participated in the recommenced Triwizard Tournament. Karkaroff brought twelve students with him to Hogwarts to put their name into the Goblet of Fire. However, it was Krum who was chosen as the Durmstrang representative. As Krum was a celebrity, he was constantly hounded by Draco Malfoy and other students, who wanted autographs and the prestige of being close with him. Krum mostly ignored these advances, but formed a close friendship with Hermione Granger, a Gryffindor student. They continued communication after the Tournament through letters. Karkaroff fled after Lord Voldemort rose again. It is not known who took over, or whether the school's reputation improved or worsened due to this. Durmstrang, like Hogwarts School of Witchcraft and Wizardry, is inside a castle, though their castle is not quite as big as Hogwarts. The castle is only four stories tall and fires are only lit for magical purposes. It has very extensive grounds. In addition, the school is Unplottable; Durmstrang, like other schools, likes to conceal its whereabouts so the other schools cannot steal their secrets. Their arrival by ship implies that Durmstrang is somewhere at the seaside or by some river or major lake. Durmstrang is notorious for its acceptance of the Dark Arts, and was known to have educated (and later expelled) Gellert Grindelwald before his ascension as a Dark Wizard. Former Headmaster, Professor Igor Karkaroff, was in the service of Lord Voldemort as a Death Eater, but managed to escape punishment in Azkaban by providing the Ministry of Magic with the names of his co-conspirators. Lucius Malfoy, another Death Eater, considered sending his son Draco to Durmstrang, but his mother did not like the idea of his going to school so far away. "Durmstrang" seems to be a spoonerism for Sturm und Drang, a borrowed German expression meaning "turmoil, ferment" deriving from the name of a highly emotionally driven German artistic movement of the late 1700s, precursor of Romanticism. "Sturm und Drang" literally translates as "tempest and urge" or "charge and rush" but was anglicized as "storm and stress". In an interview with Accio Quote J. K. Rowling stated that Durmstrang was located in Scandinavia, in the far north of either Sweden or Norway. However, from Krum's description of the school's surroundings in Harry Potter and the Goblet of Fire, they do not match northern Sweden but do almost perfectly match those to be found in Norway. Krum says that the castle is situated in a mountainous region, and is in close proximity to at least two lakes. Krum then goes into great detail in describing the climate at Durmstrang, stating that during the winter months there is very little sunlight. The highest point in Sweden is the mountain Kebnekaise at 6926 feet (2,106 m). This is fairly diminutive when compared with Norway's highest mountain Galdhøpiggen which measures 8100 feet (2,469 m). However, Norway's highest peak is not of a significant latitude to restrict sunlight to the degree that Krum describes, but Sweden's certainly is, being situated north of the Polar Circle. Furthermore, Galdhøpiggen is surrounded by several major lakes including Gjende and Russvatnet, whereas the northernmost point of Sweden has no lakes, the closest lake being Torneträsk, which is located in the northwest. Also, Galdhøpiggen is located near a fjord, which could explain the reason the school uses a ship to travel. 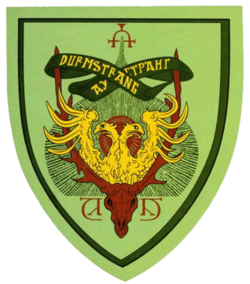 In the film, the coat of arms for Durmstrang is shown to be a double-headed eagle, and also features Cyrillic characters. Some of the regions of Sweden have crests with beings such as dragons, eagles, griffons, and giants. Additionally, one region of Sweden has a moose, eagle, and a wolf on its crest, all three of which are found on the Durmstrang crest, though Norway's national crest is a lion, very much resembling a Griffin. Some regions in Norway are also stated to have some of the same creatures on them as Sweden, both countries being of Viking descent. Also, on the German coat of arms there is an eagle similar to the one on the Durmstrang crest. In the film adaptation of Harry Potter and the Goblet of Fire, Durmstrang is pictured as an all-boy school. However, we know from the novel that there was also at least one girl studying at Durmstrang by the 1990s. Moreover, Pottermore revealed Durmstrang was founded by a woman. In the book, the hairstyle of the Durmstrang students was not described; in the film, all the Durmstrang students, who were all boys, had a buzzcut (except for Igor Karkaroff's aide and Gellert Grindelwald). ↑ 2.0 2.1 Harry Potter and the Goblet of Fire: Hermione: "It must be far north because they have fur capes on the uniform list." ↑ The Free Dictionary's definitions of "Sturm Und Drang"
This page was last edited on 18 July 2015, at 11:49. This text is available under the GNU FDL and may have been adapted from the Wikipedia article about Durmstrang Institute (history).